Apr. 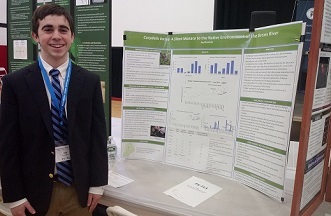 3, 2019: Bronxville High School senior Jay Burstein earned the prestigious NASA Earth System Science Award after presenting his research on invasive species during the annual Westchester Science & Engineering Fair, held at Sleepy Hollow High School on March 16. For his project, Corydalis Incisa: A Silent Menace to the Native Environment of the Bronx River, Burstein studied an invasive plant that has been spotted around the Bronx River but has also spread to Pennsylvania, Tennessee, and Virginia. “Winning a prestigious award is very meaningful because I am the first student from Bronxville to participate in this contest as a part of Bronx River Research,” he said. Pictured here: Bronxville High School senior Jay Burstein.